A partnership between Capitol Ministries and the Christian media giant Salem Media Group kicks off off this week with a mission to share CM’s ministry vision with millions of people throughout the nation, and to help believers grow in the Word. Capitol Ministries will be featured on Salem’s OnePlace.com, an on-demand site where listeners may access the ministry’s archived Bible studies and hear them being read, and LightSource.com where CM’s videos may be viewed. One of the goals of the partnership is to acquaint believers nationwide with Capitol Ministries’ mission and the biblical mandate behind it to reach local, state, national, and foreign elected and appointed political leaders with the Gospel of Jesus Christ. 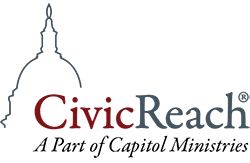 Another goal is to ignite a desire in local churches in all 50 states to partner with CM in planting CivicReach® evangelistic, discipleship ministries to their local city and county government leaders. “This ever-growing partnership with Salem Media Group affords Capitol Ministries the opportunity to achieve those goals and others,” said Ralph Drollinger, President and Founder of Capitol Ministries. “Through these avenues, Capitol Ministries will be able to communicate to millions more people our ministry vision, which is the scriptural priority of reaching government leaders for Christ to accelerate the fulfillment of the Great Commission. The weekly Bible studies that Drollinger teaches on Capitol Hill to Cabinet Members, U.S. Senators, and Representatives will also be available on the Salem websites. Capitol Ministries publishes 52 in-depth Bible studies every year that have customized applications to those in government service. The studies view contemporary issues through a biblical perspective such as Solomon’s Advice On How To Eliminate A $19 Trillion Debt, and Entitlement Programs Viewed Through the Lens of Scripture. “Tens of thousands of people already receive our weekly Bible studies and our partnership with Salem will make them available to thousands more,” Drollinger said. Visitors to the website may access the Bible studies in both audio and print format. Those formats are also available at Capitol Ministries website, capmin.org/bible-studies. Salem will also feature Capitol Ministries on Roku, Amazon Fire TV, and AppleTV. God means for Scripture to be the foundation of a believer’s thinking and reasoning. The Word of God is intended to be the mind’s bedrock, its compass. It is the only trustworthy basis for the beginning of thoughts, ideas, actions, practices and rational reasoning. In contrast is Rationalism, a theory that shuns religion and regards the mind’s own facility to reason as supreme authority. “The Rationalist sets his mind and his ability to reason as both the source and final test of all truth,” Ralph Drollinger writes in Rationalism, Rationality and the Scriptures, the Bible study that he will teach to national leaders on Capitol Hill in Washington, D.C. this week.